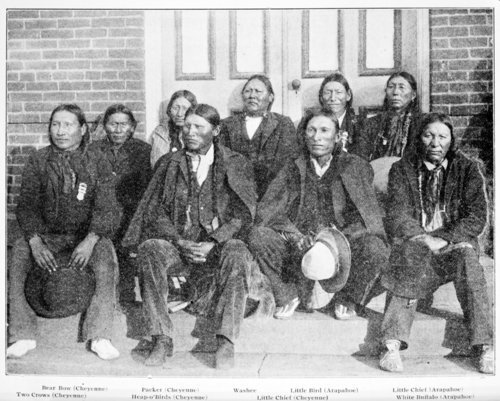 This is a photograph of ten Cheyenne and Arapaho prisoners. They are identified as (back row left to right) Bear Bow, Packer, Washee, Little Bird, Little Chief, (front row left to right) Two Crows, Heap o' Birds, Little Chief, White Buffalo. The prisoners are posed in an outdoor setting on the steps of a building. Funds for digitization provided by Mr. Steve Peckel in memory of William Chalfant.